Investors ask if the hugely successful investment banking model can be fully repaired. Two years after Lehman Brothers collapsed under $613 billion of debt, investors are questioning whether the investment-banking model that fuelled record profits in the middle of the decade can be repaired. Of 10 banks with large capital-markets business units, only Goldman Sachs Group Inc and JPMorgan Chase & Co are trading close to their price on September 12, 2008, the last day of trading before Lehman filed for bankruptcy. 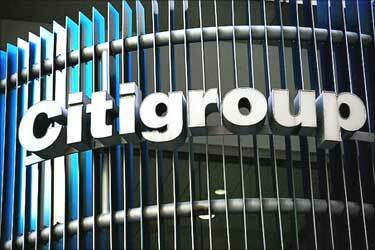 Citigroup Inc has lost 78 per cent, and Bank of America Corp is down 59 per cent. The average is a 23 per cent decline, more than double the 10 per cent drop in the Standard & Poor's 500 Index over the same period. "The fundamentals of their businesses aren't going to be anywhere near as good as they were pre-Lehman," said Jon Fisher, a portfolio manager at Fifth Third Asset Management in Minneapolis, which handles more than $18 billion. "Every aspect of the business has been damaged." The collapse of Lehman, the fourth-biggest US securities firm when its 158-year history ended on September 15, was the most dramatic and controversial event in the financial crisis. The bankruptcy and the economic damage that ensued reduced the number of competitors in the banking industry and resulted in new regulations that set limits on banks' activities and require them to hold more capital and liquid assets. 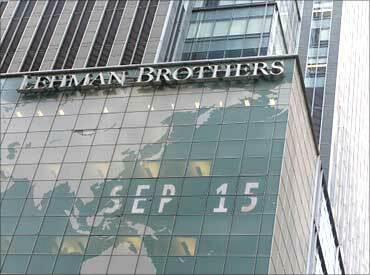 Image: The Lehman Bros headquarters. The earnings outlook for the world's biggest Wall Street banks remains pallid compared with profits in 2006, the year that preceded the onset of the credit crisis. Estimates for 2011 earnings per share are lower than 2006 for all except JPMorgan, according to data compiled by Bloomberg (see table below). Citigroup's 2011 EPS is forecast to be 89 per cent lower than in 2006, while Bank of America and Zurich-based UBS AG will probably fall more than 60 per cent below 2006 levels on a per-share basis, estimates show. "We see more pitfalls than we do potential profits in that group, and then there are so many question marks with regard to financial-services regulation," said Peter Sorrentino, senior portfolio manager at Huntington Asset Advisors in Cincinnati, which manages $13.3 billion and has reduced its holdings in large-bank stocks. "The rules of the business have all been changed." Fisher and Sorrentino said they're staying away from the big Wall Street bank stocks because the companies' business models will be changed for years to come. Government rules limiting proprietary trading and investments in hedge funds and private equity are among the regulatory changes that would also hamper profit growth, they said. FOR 10 BANKS WITH GLOBAL CAPITAL-MARKETS BUSINESSES. OF ANALYSTS SURVEYED BY BLOOMBERG. 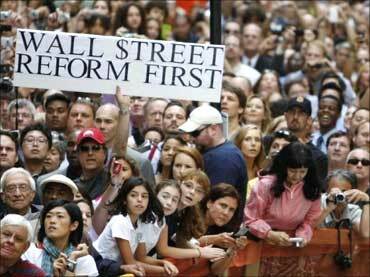 Image: People protesting during President Barack Obama's visit to New York. Peter Kovalski, a portfolio manager and bank industry analyst at Alpine Woods Capital Investors LLC in Purchase, New York, is more optimistic. Banks such as Citigroup and Bank of America are languishing because they issued large quantities of stock, devaluing the shares outstanding, Kovalski said. Amid signs that the economy and credit quality are improving, he said he expects a surge in mergers and acquisitions among small banks that could renew buying interest in financial companies. "Once you start seeing more and more deals announced, in addition to improving credit quality, that's when you're going to start seeing the institutional investors jump back in the sector," said Kovalski, whose company manages about $6 billion. His top pick among big banks is New York-based Citigroup, which he expects to climb when the US Treasury finishes selling its stock in the nation's third-largest lender. The market is undervaluing many of the large-bank stocks, whose earnings will benefit from lower credit charges as the economy recovers in 2011 and 2012, said David Hilder, a New York-based senior analyst covering financial stocks at Susquehanna Financial Group LLLP. He has positive ratings on Bank of America, JPMorgan, Wells Fargo & Co and Morgan Stanley and a neutral rating on Citigroup, he said. "The biggest impact on bank earnings over the near term will be from lower credit-loss provisions - that trumps everything else, whether it's loan growth or net interest margins or trading volumes," said Hilder. "Credit-loss provisions will go down a lot because the economy is recovering and the banks have built very large reserve positions." Uncertainty about how US financial regulatory reform will be implemented is a concern for investors, Hilder said. Still, he said he doubts the new Basel capital requirements, derivatives-market reform or Volcker rule restrictions on proprietary trading and hedge-fund investments will make a meaningful difference to banks' earnings. "I honestly don't think that either the Volcker rule or the restructuring of the derivatives business is what's driving current valuations," he said. "The largest US banks all have extremely high capital levels." Investors may be shunning large-bank stocks, even at depressed valuations, because they haven't recovered from the psychological shock of Lehman's implosion, said Michael Farr, president and founder of Washington-based Farr, Miller & Washington LLC, which manages about $650 million. 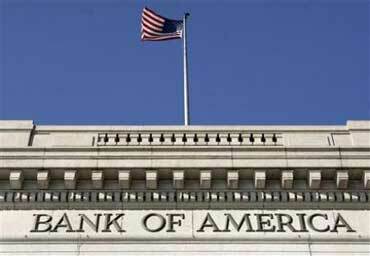 He said he recently bought shares of Bank of America because the stock is trading close to tangible book value. "Prior to Lehman there was an abundance of the faith on behalf of depositors and investors that's absolutely essential for a banking system - there was a real trust," Farr said. "After Lehman we all began to see that as we looked behind the curtain, the guy pulling the levers was not in very good shape at all. Valuations look very low to me, and I think there's opportunity there, but I think there's also ample reason for the abundant caution that investors are showing," he added. 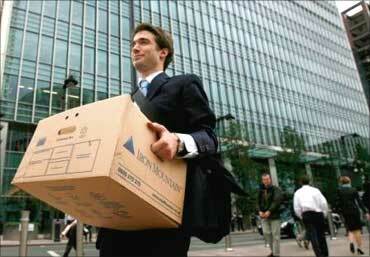 Image: Lehman employees leaving, after it collapsed. Buying a home? Groffr can get you a BIG discount! 'Photocopy Phokat mein' is their mantra!